Four Fagotten Bassoons are bringing their own brand of music to South Jersey as the 2014 outreach arm of Music at Bunker Hill. 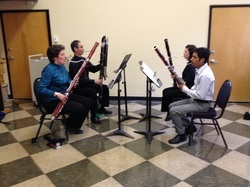 Their name is a musical play on words, loosely translated as "Four bassoony bassoons." They just liked the sound of it. Members Martha Frampton, Mike Pedrazzini, Raymundo Jacinto and Pamela Turowski formed the quartet in fall of 2013 and have enjoyed playing at various functions. This quartet is moderately portable since there is no piano involved, making it an ideal outreach group. Their music ranges from Bach Air on a G String to Pink Panther to Scarborough Fair. Past performances include Sigma Alpha Iota Philanthropies concert, Sunday Afternoon at Free Library in Philadelphia, Composition Night at Pennsville HS, and Memorial Concert for Lawrence Stewart of Rowan University. They perform outreach concerts for Boys and Girls Club of Paulsboro on May 9, and Woodbury May 22, and for the Butterfly Release for McGuinness Funeral Home in Wash. Twp. on May 10.